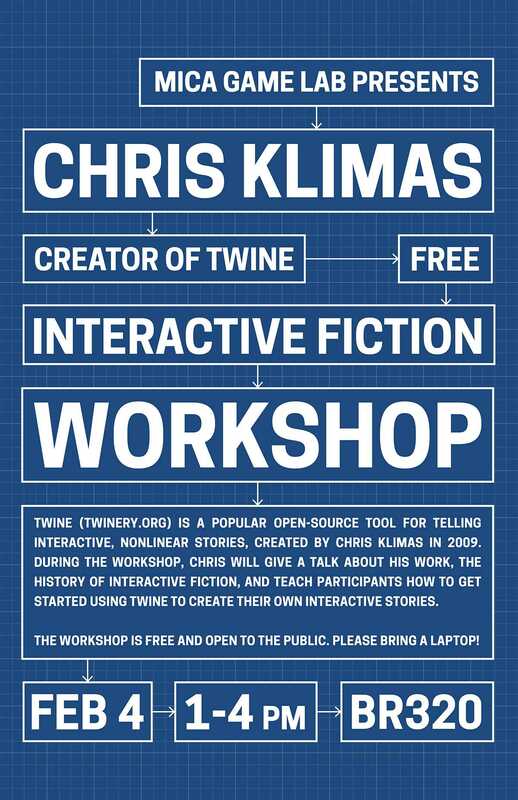 The MICA Game Lab was excited to host a free Twine workshop and lecture by Chris Klimas. Twine is a popular open-source tool for telling interactive, nonlinear stories and was created by Chris in 2009. During the workshop Chris gave a talk about his work, the history of interactive fiction and lead a workshop teaching participants on how to get started using Twine to create their own interactive stories. The event was free and open to the public and Chris’s lecture can be viewed below. Chris Klimas created Twine, an open-source tool for interactive text-based storytelling, in 2009 and continues to lead the project. He’s also the author of several interactive fiction works, including the award-winning Blue Chairs, and is a principal at Unmapped Path (https://unmappedpath.com/).